A reimagining of Falcom's classic action RPG franchise that takes place in modern-day Tokyo instead of the usual fantasy setting the series is known for. Tokyo Xanadu is an action RPG set in modern-day Japan about a group of high schoolers that secretly battle against monsters that live in an alternate dimension beneath their town. The game is a reimagining of Falcom's long-running Xanadu franchise and was published for the PlayStation Vita in Japan on September 30, 2015. An enhanced port for the PlayStation 4, called Tokyo Xanadu eX+, was released the next year that included new story content, gameplay improvements as well as improved visuals and framerate. 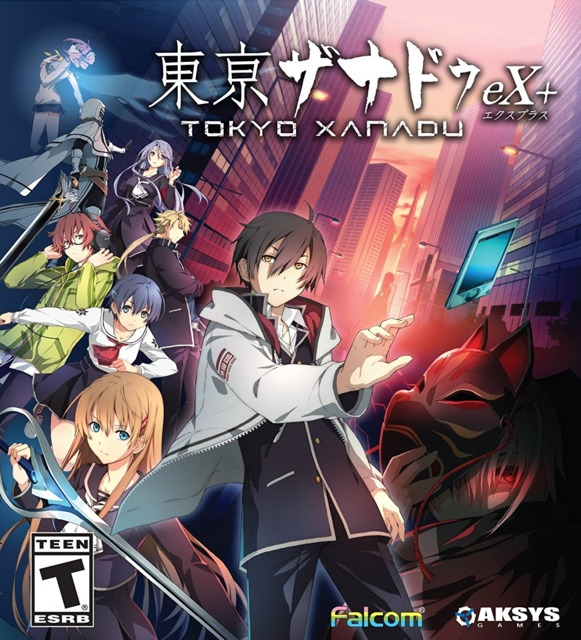 Aksys Games published the PlayStation Vita version of Tokyo Xanadu in the United States on June 30, 2017 and later released the eX+ edition on December 8, 2017 for the PS4 as well as on the PC with a new port developed by Ghostlight. Kou Tokisaka finishes up one of his part-time jobs when he accidentally stumbles into an alternate dimension while following transfer student Asuka Hiiragi. Kou soon finds himself involved in a secret organization called Nemesis fighting against monsters known as Greed in the dimension known as the Eclipse. As the incidents involving the Eclipse quickly pile up, Kou and Asuka keep fighting against the Greed while trying to find the source of the incidents before Japan is overrun by the Eclipse. Kou Tokisaka: A second-year student at Morimiya Academy who shuffles several part-time jobs. His Soul Device is a chain-whip attached to his arm. Asuka Hiiragi: Kou's classmate and class representative, secretly a member of Nemesis who monitors issues around the Eclipse. Despite her attempts to keep as few outsiders involved as possible, she reluctantly lets Kou and the others join her fight against the Greed. Her Soul Device is a rapier. Sora Ikushima: The tomboyish freshman and childhood friend of Kou who trained in karate under his grandfather. She joins the team to save her friend, Chiaki, from the Eclipse. Her Soul Device is a pair of gauntlets. Yuuki Shinomiya: A master hacker and shut-in who joins the team to save his sister's spirit from the Eclipse. His Soul Device is a large mace with a separate floating drone nearby. Mitsuki Hokuto: Student Council President and granddaughter of the Hokuto Group's founder who also works as a member of Zodiac, another secret organization that deals with the Eclipse. Her Soul Device is a two-handed staff. White Shroud: A mysterious figure whose true identity and motives unknown, they seem to have a great deal of experience with the Eclipse and battling the Greed. Their Soul Device is a giant sword. Occasionally teams up with a "Man In Battle Suit" wielding a rifle. Players take control of Kou (or another party member as they wish) and can explore specific areas within the city, talking to a wide variety of NPCs in town and learning more about them. They can also purchase items, get quest information, and on occasion even raise their affinity level by talking to a specific NPC while holding a crystal. While exploring the Eclipse, players may generally choose three characters to go through the dungeon, preferably based on their elemental affinities and those of the Greed within the selected dungeon. Players only control one of the three, but can switch at any time, provided the selected character still has HP. Flying Attack: An aerial attack that uses some of the party's magic meter, but allows the character to fly forward a short distance to traverse gaps or maneuver around the enemy. Power Attack: a super-powered melee attack that can stagger some enemies and is more powerful than a standard Melee Attack. Can also clear certain obstacles in a dungeon. EX Strike: An attack that gives the character a brief moment of invincibility while they unleash a powerful magic attack on enemies, properties differ with each character, extremely limited meter that requires charging. X-Strike: A powerful attack useful in striking multiple enemies at once within the same room. Builds with a separate meter. X-Drive: Can only be unleashed when "D Gauge" is full. Selected partner will join the fray with you and unleash a barrage of attacks on any enemies in the room until the meter runs out. Furthermore, all attacks will be considered critical hits, status ailments and staggering on the player will be ignored, damage received will be much less and even gradually healed while the X-Drive is active. Playable "Side Stories" between each chapter that provide additional backstory for various characters, including their own Eclipse dungeons and bosses. Bonus chapter that takes place after the main story, with its own dungeon and final boss. Bonus minigames at the arcade are playable for prizes. White Shroud is now a playable character at some points in the game.